Scott Lewis and Andrew Keatts talk about how Democratic leaders and labor unions are wielding their growing influence. San Diego Dems are gaining steam. Shifting demographics are driving the region further away from its traditional Republican roots. In this week’s show, Scott Lewis and Andrew Keatts talk about how Democratic leaders and labor unions are wielding their growing influence. Dems have used some of their momentum to push reform of several local government agencies — powerful institutions that have a big impact on regional planning, land use and governance. Keatts broke the news this week that Assemblywoman Lorena Gonzalez Fletcher is proposing legislation to put the San Diego County Regional Airport Authority back under the Port of San Diego’s umbrella. She says the move would make for a more cohesive approach to regional planning. Meanwhile, the Airport Authority’s chairwoman says they’re doing just fine. Reforming the Airport Authority is just the latest move by the Democratic leader. Gonzalez Fletcher also joined labor unions in the effort to revamp Civic San Diego, the downtown redevelopment agency that’s now in the midst of a major overhaul, and she wrote the bill reforming SANDAG, the regional agency mired in scandal last year. 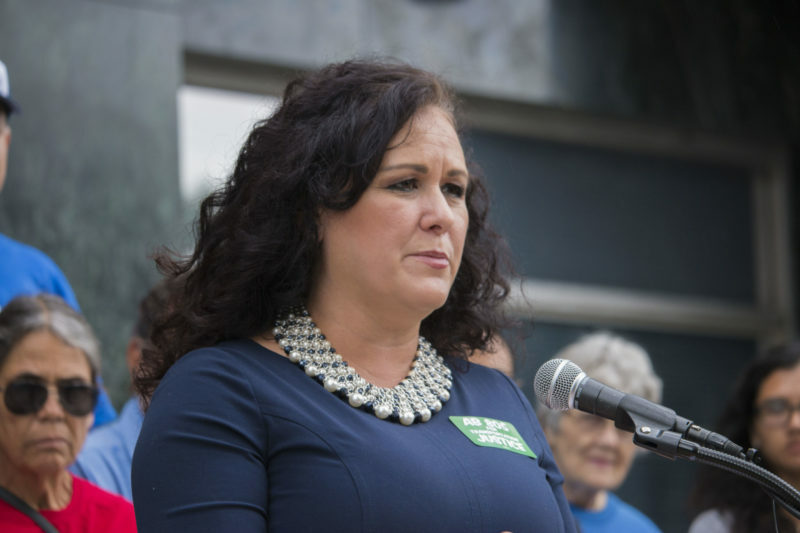 And earlier this year, Democratic Councilwoman Georgette Gomez became the Metropolitan Transit System’s board chair, yet another example of Democrats ascending. Also on the podcast, Lewis and Keatts discuss how neither of the proposals to redevelop the Mission Valley stadium site include solid guarantees to voters, according to a new city attorney memo, and the co-hosts narrow down the list of local politicians who might want to greet President Donald Trump when he visits the border wall prototypes in Otay Mesa next week. Finally, The Kept Faith, a VOSD Podcast Network show, produced a hilarious parody episode, which we sample in the show. The hero this week is Nathan Page. When a special education student was sexually assaulted by a classmate at Lincoln High, Page, a teacher there, pushed unsuccessfully for a more stringent response to the incident. The school’s response tormented him and he’s since died of an apparent suicide. The San Dieguito High School Academy administration is the goat. After San Dieguito math teacher Donn Boyd was reprimanded last May for inappropriate behavior with students, he was allowed to finish out the school year and returned to the classroom for a new year in the fall.